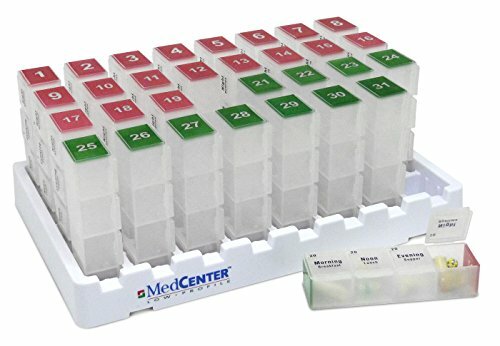 The MedCenter Monthly Medication Organizer is a 31-day organizer and reminder system for your pills, medications and vitamins. It's the perfect tool to help you keep your personal health plan on track It will save you time tracking medicine and reduce the chance of missed or duplicate doses. This compact unit holds 31 numbered daily pill boxes, each of which has 4 compartments marked with a dose time, as follows: Morning (Breakfast); Noon (Lunch); Evening (Supper); Night (Bedtime). Just load all of your pills at the beginning of the month, then as each day arrives pull out that day's pill box. In this Low Profile model, the rows are all at the same level so that the unit sits lower on countertops and takes up less space. As an added convenience, pill boxes show the day of month (1 to 31) in red at one end and green at the other end. Start the month with the green sides facing out, then once you've used a day simply reverse it so the red side is out. This system gives you a quick visual indicator of what day you're up to. The large compartments are great for larger sized pills and multiple medications/vitamins. Package includes: One pill stand plus 31 four-cavity pill boxes. One-year warranty. Specifications: Unit measures: 10.625 in. W x 6.75 in. D x 4.125 H Individual pillboxes measure: 5-7/8 in. L x 1-1/4 in. W x 7/8 in. H Unit weighs: 3 lbs. 6oz.